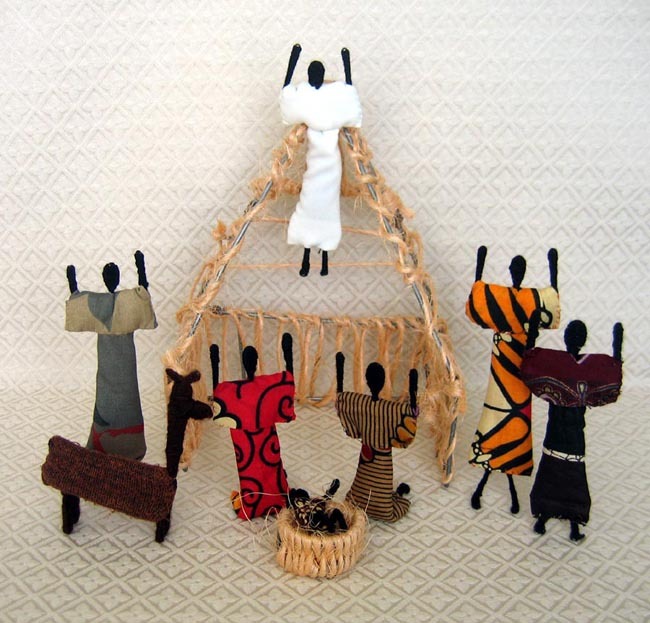 This Nativity is made from wire and twine by George and Faith Mushipi, who are house parents for the Children’s Resource Center, an orphanage in Lusaka, Zambia. George bends five different kinds of wire and wraps the twine for the Nativity stable and figures, while Faith hand-stitches the colorful clothing and stuffs the figures with wool. The standing figures measure 7 inches tall. The stable measures 11.75 inches tall to the top of the angel. The couple jointly cares for the 25 orphans on the property. George is responsible for the social development of the children, while Faith does the cooking and cares for the children’s emotional and physical needs. Proceeds from the sale of this Nativity benefit an organization dedicated to supporting orphans in Zambia and other countries.